The programme for the CUSO workshop “Methodological approaches to synchronic and diachronic heritage language data”, to take place at the Université de Lausanne on 16 and 17 February 2018, is now online! 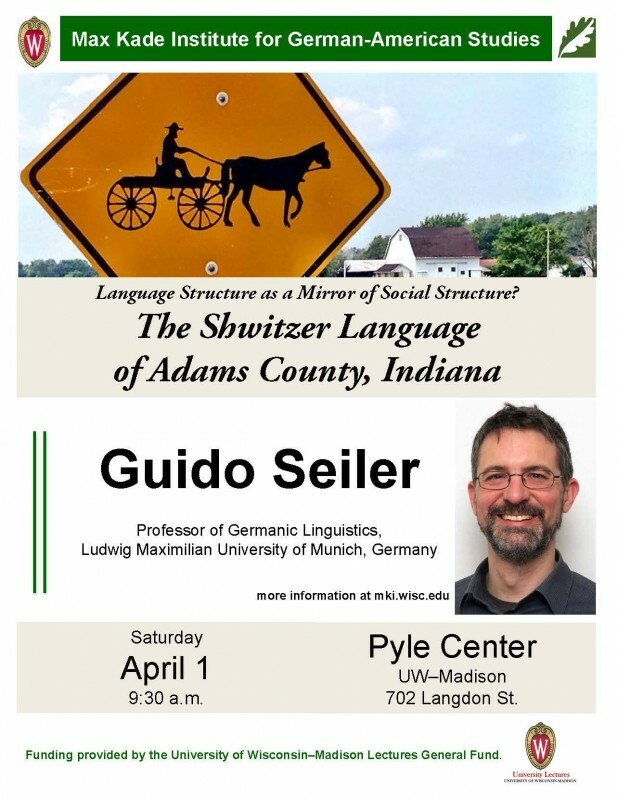 As part of the workshop “New historical perspectives on non-dominant speakers as agents of contact-induced language change” (ICHL 23, University of Texas San Antonio, US), Guido Seiler has talked about the language of the Amish Shwitzer. Talk by Anita Auer on “Preserving Swiss Dialects in the Diaspora: The Social Life of a Wisconsin Language Island”, 7 April 2017 in New York. Anita Auer is giving a plenary talk on Preserving Swiss Dialects in the Diaspora: The Social Life of a Wisconsin Language Island on 7 April 2017 from 6:45 – 8:00 at New York University. The talk, which is free and open to the public, will be given as part of the HiSoN 2017 Conference. 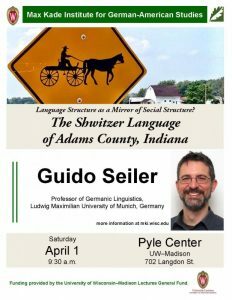 On 1 April 2017, Guido Seiler is going to give a talk on Language Structure as a Mirror of Social Structure? The Case of the Shwitzer Language of Adams County, IN at the Max Kade Institute for German-American Studies at the University of Wisconsin, Madison. Details can be found on the poster on the right. Anita Auer, Arix Xanthos (UNIL) and Daniel Gatica-Perez (EPFL) have been awarded a CROSS (Collaborative Research on Science and Society) grant for their project « Multimodal Linguistic Crowdsourcing: Tracing Swiss Heritage Speakers’ Identities in North America ». This project aims to capture the language use and cultural practices of Swiss German emigrants in Wisconsin (US) by way of a multimodal crowdsourcing app. The reflections of Swiss identities abroad – from the nineteenth century to the present day – can be found in different modes such as emigrant letters, early printed newspapers, diaries, recordings of mid-20th-century interviews as well as interviews carried out today, and the surroundings/landscape, e.g. Swiss German signs, Swiss architecture. The purpose-built app will allow the so-called “heritage speakers” to capture all of these different aspects of their Swiss heritage, which can be done by taking geo-localized pictures, recording themselves or others, and filling in questionnaires. The researchers will, with the help of the heritage speakers, propose quality guidelines for the different processes (data collection, curation, and labeling) that are involved in the crowdsourcing part of the project.